The sun will set soon on the Malecon. I’m walking away from the city centre, on the wide slippery sidewalk, while the waves crash tirelessly on the rocks and on the rough stone of the seawall. On one side stands the Castillo de San Salvador de la Punta, while on the other the coast fades into nothingness, giving space to a bunch of modern buildings and resorts that Cuban people will never be able to afford. Right beside the “no fishing” signs, a row of casual fishermen waits patiently to catch something. There are food vendors, couples, groups of friends, musicians… the dynamic soul of a contradictory city. I walk slowly, watching my step to avoid catastrophic falls, taking pictures, staring at this deceptively clear water, feeling the smog burn my throat. On the other side of the road, crumbling buildings and fancy cafes stand side by side. Welcome to Havana. 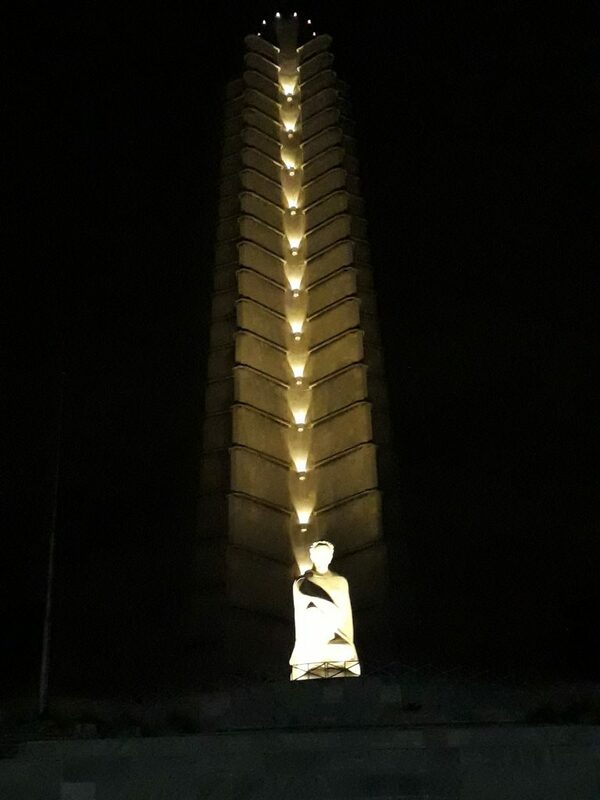 I still got my picture, like a good tourist, and then headed back to Vedado. There’s a very lively plaza at the corner of Avenida 23 and Calle L, with a big ice-cream parlor [called Coppelia], live music and lots of little restaurants. Consider the area to grab something to eat at a decent price. Vital tip if you tend to get lost: bring a map with you or load the map on Google Maps beforehand. The GPS will still work even without connection, so you’ll be able to get around. It’s not too hard to find your way in Havana, but the first few hours are always very confusing. Havana is much prettier by day than by night because of its incredible colors. On day 2 a couple of new friends and I started our big city exploration once again from the Malecon, but walking towards the city centre this time. In 1 km we have been stopped at least 3-4 times by people who wanted us to buy cheap cigars or other random stuff. These long conversations with over-friendly Cubans are part of living the city, but honestly I found them to be quite exhausting after a while. Feel free to ignore these people if you’re not comfortable. 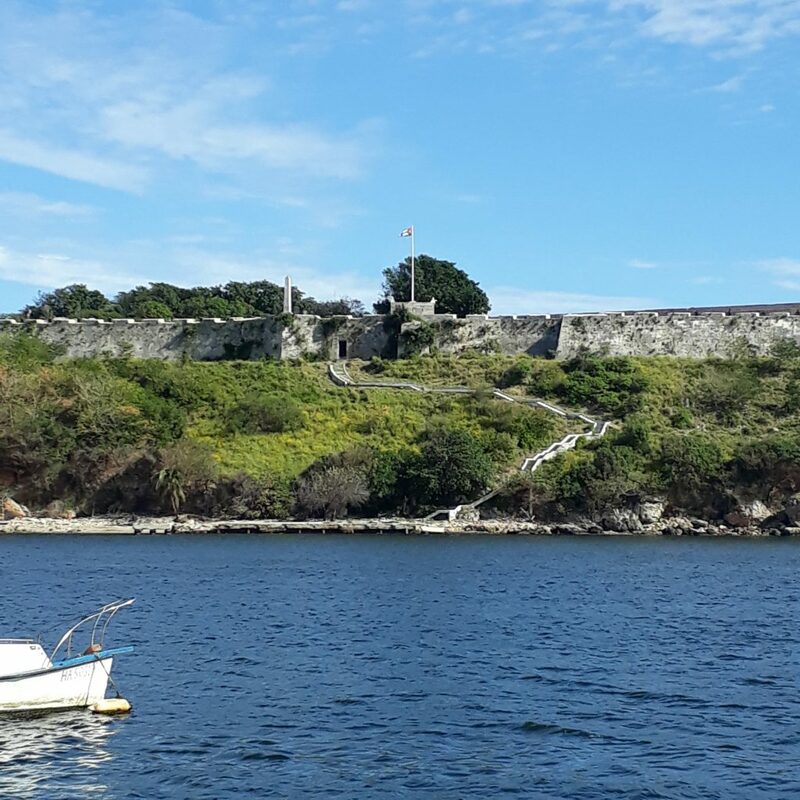 At one point, the Castillo de los tre reyes del Morro, a fortress dating back to the 16th century, will appear in front of you on the other side of the water along with the statue of the Christ of Havana. The easiest way to get across is by lanchilla from the ferry terminal, but I would recommend to save it for later. 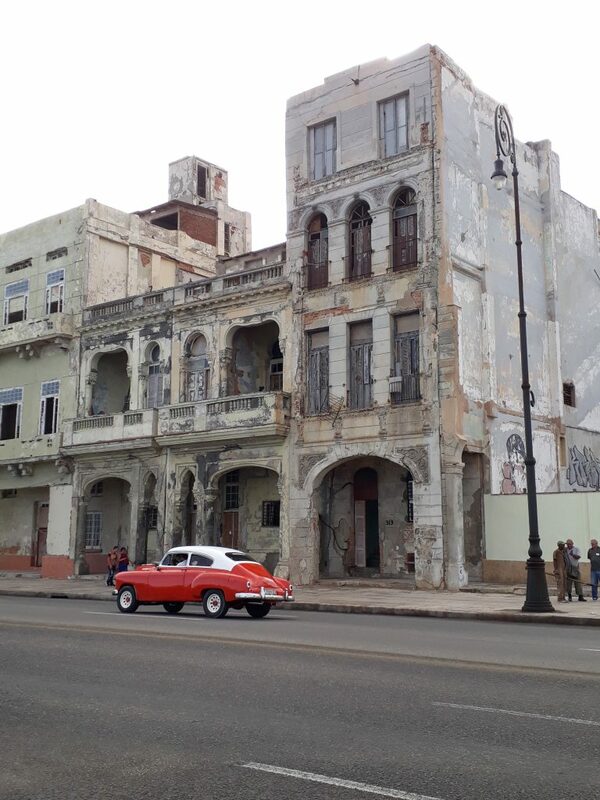 We walked all the way to the Cruise Terminal and then turned right into Habana Vieja to discover a whole new world of beautiful churches, occasionally paved calles, green plazas, quaint restaurants, crumbling buildings and a general swarming of people everywhere. Overwhelmed by it all, we closed our maps and wandered around the bustling streets, occasionally taking breaks on benches to observe the scene around us. 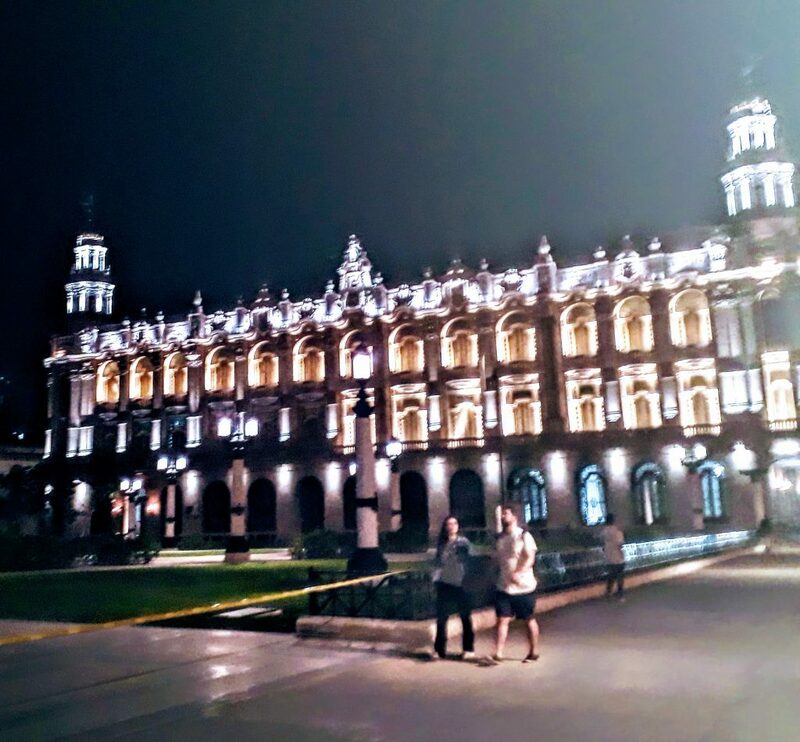 There are four main squares worth seeing: Plaza de la Catedral, Plaza de Armas, Plaza de San Francisco and Plaza Vieja. 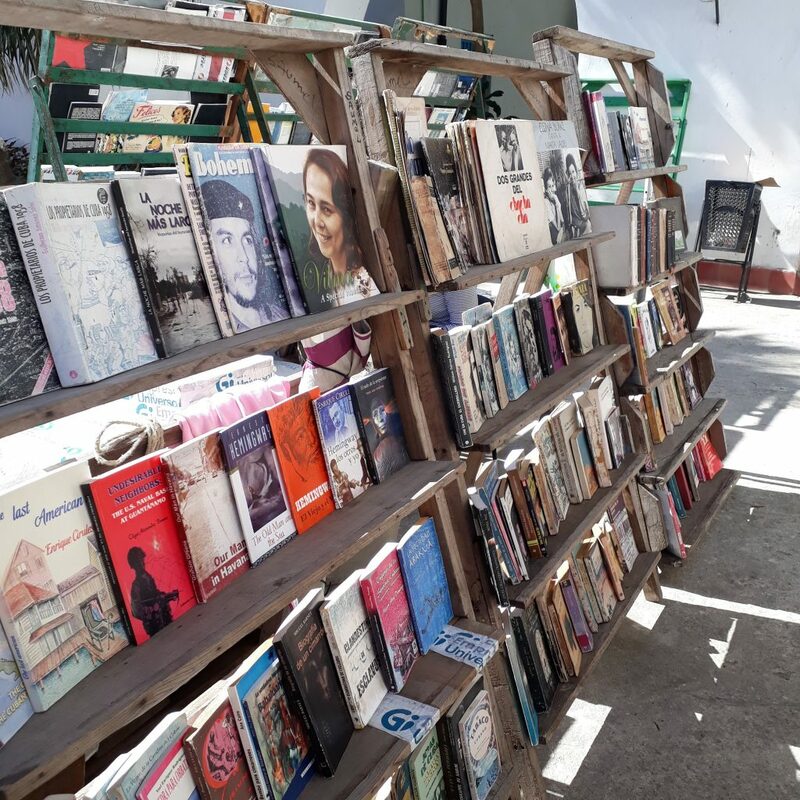 In a calle behind Plaza de Armas there is a lovely book market where you can find old books, prints, vintage objects and more. For some souvenir shopping, I recommend the big Artisans’ Market beside the Estacion de Ferrocarriles: the vendors will do whatever they can to convince you to buy from them, but if you stand your ground you can find some good deals. When I’m exploring, my lunches are very much on the go, so I found a local bakery and got a big bag of bread for a few Cuban pesos (30 cents or so), but if you’re a normal person there are a lot of picturesque cafes and posadas and restaurants for all tastes and pockets. If you’re a budget-conscious traveler, look for the little kiosks selling bocadillos or the food carts on the street: you’ll be able to get a simple but filling lunch for 1-3 euros. 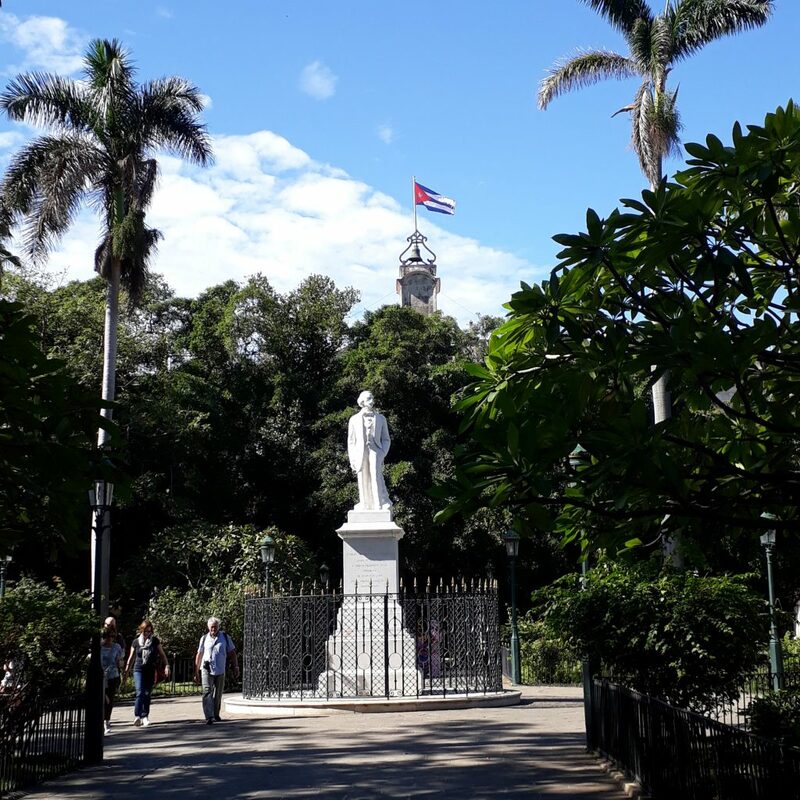 After a short siesta we moved to Centro Habana, which revolves around Parque Central and whose main attraction is el Capitolio Nacional. Among the thousands people who tried to stop us on the street, a couple of them mentioned that the Buena Vista Social Club (pronounced “Cloob”, guys) were playing that night and took us to the venue to get our tickets. Beware of these people: if you talk to them for too long you’ll find yourself in a bar drinking an overpriced cocktail and paying for theirs as well. We saw it coming and went along with it because the guy was nice and helped us with the tickets, but normally the best strategy is to just ignore everyone and keep going. Sometimes when I was walking alone and didn’t want to be bothered, I would put my earphones on without music, so that I could ignore everyone without feeling too bad about it. So, after securing our tickets and having a drink way too early during the day, we headed back to the hostel to freshen up and rest a little bit before our night out. We paid 30 CUC for the show, which is a lot for locals but pretty good for Western standards, considered that 3 drinks are included in the price. Music is a big part of Cuban culture, so I highly recommend you catch a show while you’re there, the Casa della Musica or el Pabellon Cuba have something on every night, but there are also many Jazz clubs around to choose from. The event, held at a nice venue a couple of blocks from the Capitolio, was quite an experience. Every group had a private table and the band was on a small stage in a corner of the room. Each singer would walk around the room giving high fives to guests, while two super-talented dancers were twirling around. After the third mojito we were all quite happy and keen on dancing, even yours truly who is basically a log on two legs. The band played for two straight hours and, despite being clearly an event for tourists, we were pretty satisfied. Havana is a safe city, we walked back home at midnight and didn’t have any problems at all. At the hostel, all the guests were having a party so we joined the fun for another 3 hours, but that’s another story. Hostels are not for everybody, but I always recommend giving them a chance at least once, because you can make life-lasting friendships and share unforgettable moments. On day 3, take a break from the city and head to the beach for some well-deserved relax. Pack your sunscreen, a towel, some water and snacks, your camera, a handful of Cuban pesos (you’ll need them for the local buses) and you’re ready to roll! We headed to the Estacion de Ferrocarriles by bus, but depending on where you’re staying you may be able to just walk there. Every bus ride costs just 1 Cuban peso anyway, so it’s more than affordable. Once at the station, ask around where the bus A40 stops and wait in line. People who already have the ticket will have priority, but don’t worry if you can’t make the first bus, they run very frequently. Be prepared for an incredibly packed vehicle, for some reason the driver keeps letting people on even when there’s clearly not even an inch of space, so I’ve seen people riding literally half outside of the bus. 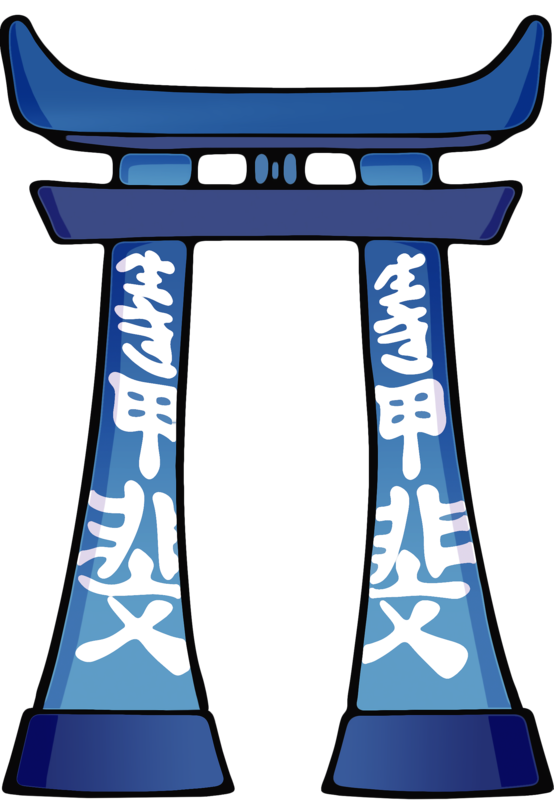 It’s undoubtedly a very interesting experience to mingle with the locals, even though not exactly the most pleasant. If you’re Caucasian, accept the fact that people will stare shamelessly at you, but well, try to ignore them if you can. You’ll get off at Playa de S.Maria, after 30-40 minutes on the bus. The stop is not signaled anywhere, so keep an eye on your Google Maps and/or, even better, ask the person next to you to let you know where to get off. People are usually very nice and helpful. I cheated because I was with three Spanish native speakers, so they did all the work for me (perks of the hostel!). The bus drops you off on the side of the road, you’ll have to walk down a hill for about 500-600 meters and there… the beach will be waiting for you. La Playa de Santa Maria is a pretty white sand beach that goes on and on for a few kilometers, leaving plenty of space for everybody, tourists and locals alike. Some areas are reserved for the clients of the resorts, but anyone can rent sun loungers and beach umbrellas for incredibly low prices (something like 2 CUC for an umbrella, which is unheard of in Italy). And if you’re in need of a drink, there are a few vendors that have water, beer and some cocktails, whereas the “coconut men” will sell you a coconut for 2 CUC (3 CUC if you want some rum in it). If you’d rather go back by taxi, you’ll find some on side of the road, hungry for customers, so that’s an option too. At night, the city comes to life once again. 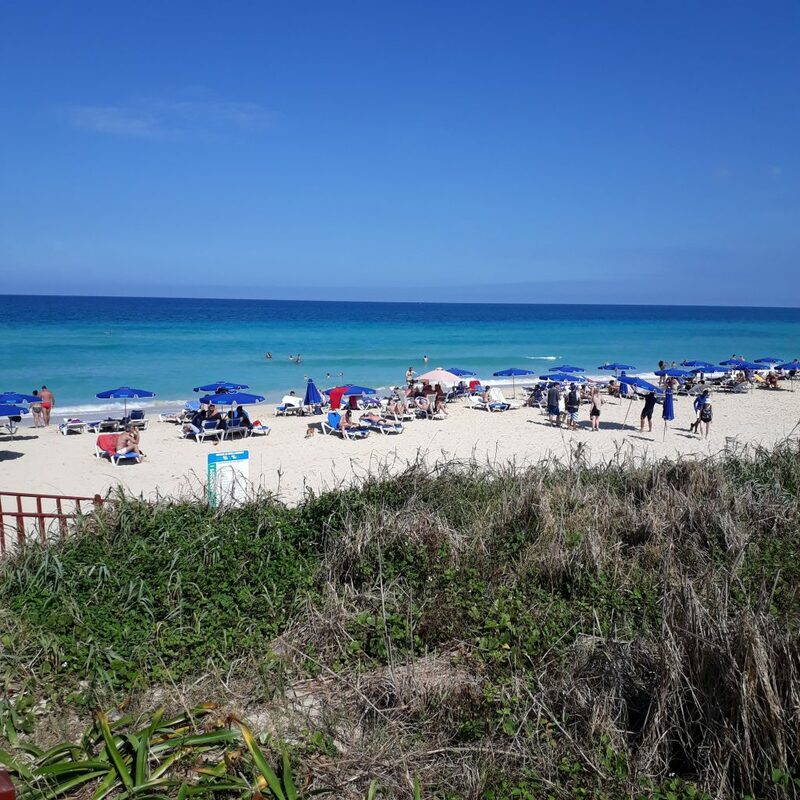 In Vedado there’s no shortage of clubs and bars, but if you prefer a quieter and more intimate atmosphere (like me), buy some beer at a local kiosk or grocery store and head to the Malecon. Despite being lively, the Malecon allows you to have a chat with your friends in a calmer and beautiful environment. There will still be music, but not so loud that you can’t hear the other people talking. Alternatively, ask your host for recommendations. On day 4, immerse yourself again into the city. Explore Centro Habana a bit more, maybe take a tour on one of those vintage colorful cars (I personally didn’t because I like to walk, but they’re supposedly good) and hunt for souvenirs. 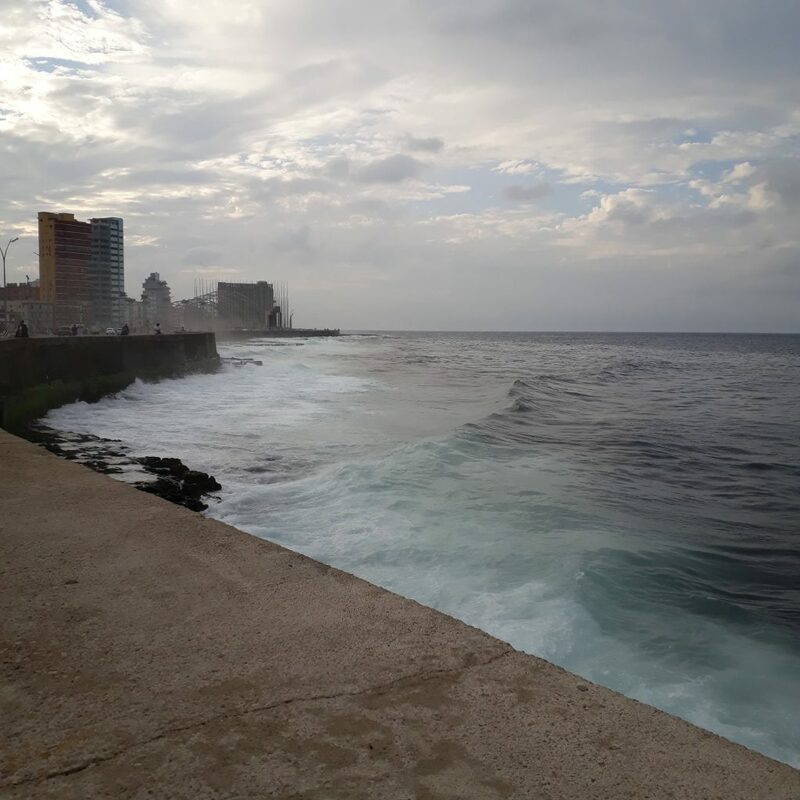 In the afternoon walk to the ferry terminal past the Cruise Terminal and catch a lanchilla to Casablanca, the island in front of Habana Vieja. The trip takes only 5 minutes and costs 1 peso. Visit the two fortresses and then climb the hill up to the Christ at sunset. Sit there and enjoy the ever-changing colors of the city as the sun sinks into the bay. Walk around, take your time on top of the hill and take pictures. 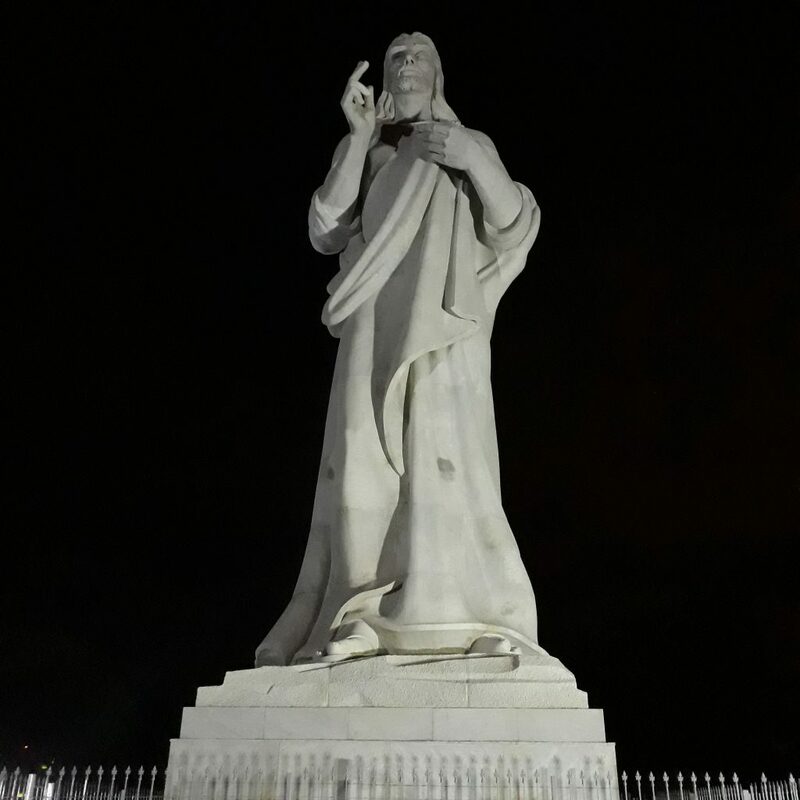 We got there at around 6 pm and stayed for a couple of hours chatting and browsing Wikipedia for the biggest statues of Christ in the world. The lanchilla departs every hour and runs until late (11 pm for sure, maybe even midnight), so it’s almost impossible to remain stuck on the island. 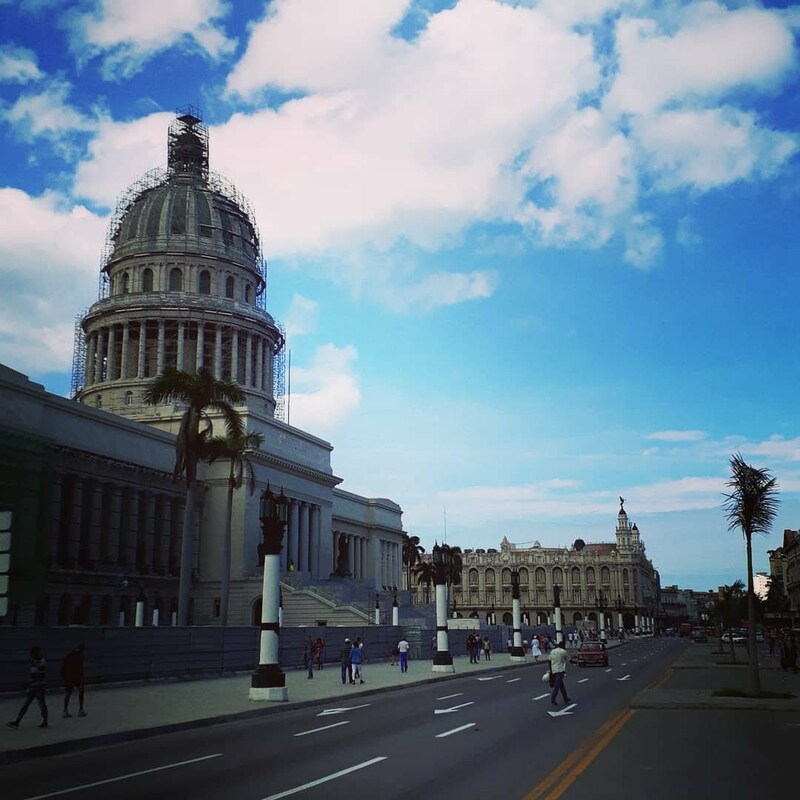 Once at the terminal, you can either walk to Habana Vieja for dinner or take one of the multiple buses that stop outside and get closer to your accommodation. Public transport to and from the international airport is basically non-existent, so you’re stuck with a taxi. 20 CUC is a reasonable price for a ride (still expensive but there’s not much we can do), so bargain hard. If you arrive during the day, the alternative is to walk for about 1.5 km from the airport to Ave. Boyeros and catch the P15 bus to the city centre. Public buses cost basically nothing, but they get incredibly crowded, so if you have big luggage and are tired it may not be the best idea. 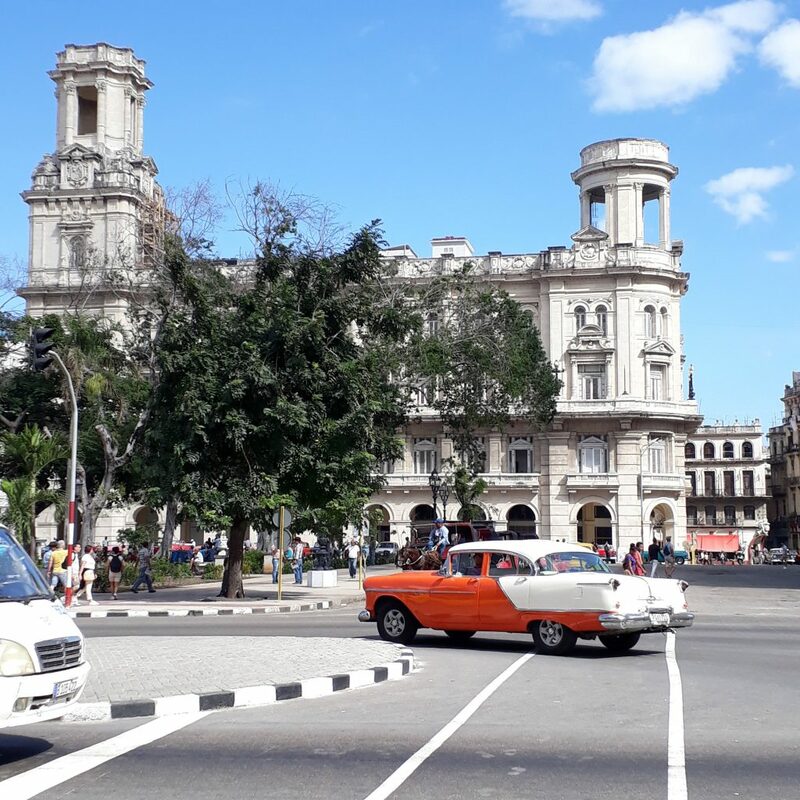 What you want to visit in Havana are three main areas: Habana Vieja, Centro Habana and Vedado, so I would recommend choosing your accommodation accordingly. 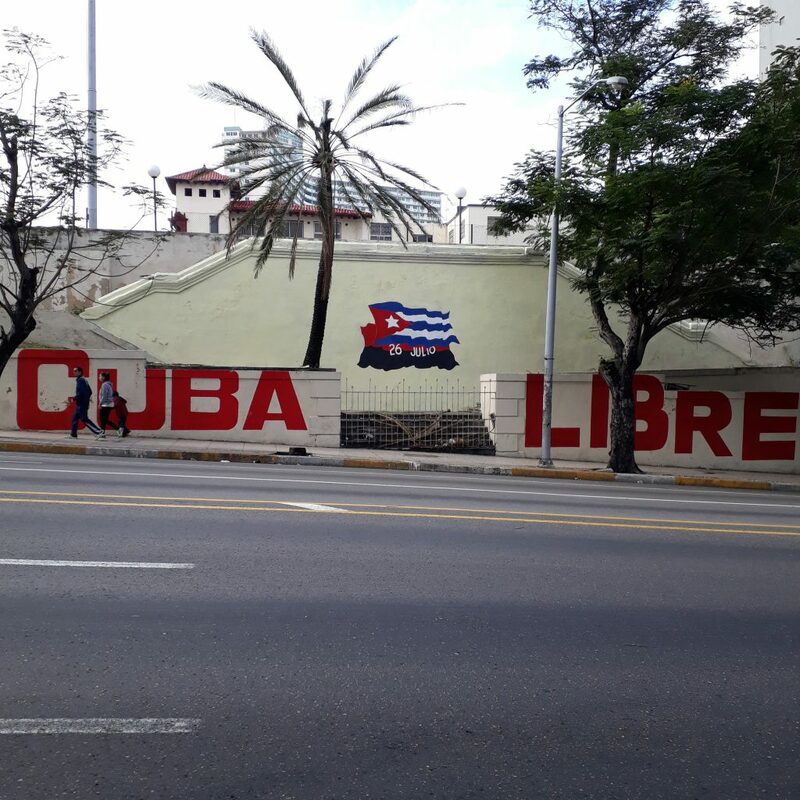 I stayed in Vedado really close to the university and I would say that it’s a good strategic point, since everything is within reasonable walking distance: restaurants, the Malecon, el Capitolio, night life, the old town. My personal hostel recommendation is the Hostal Caissa on calle Neptuno, more for the atmosphere than for the amenities. The host Eric is extremely helpful and nice, he will offer advice on what to see and help with taxis and accommodation in other cities if needed. The place is not fancy but clean and cosy and it’s small enough that you get to meet all the other guests. Plus, it’s really cheap. 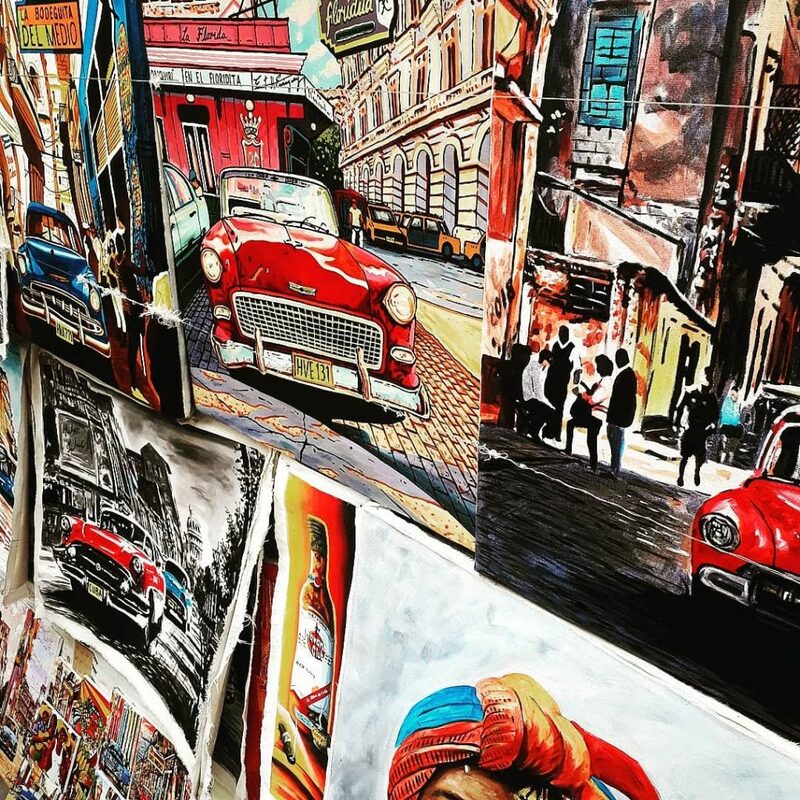 “At least half of Havana’s attraction is visceral. You’ll fall in love here but you’ll struggle to ever understand why. The city is an impenetrable muse, the ultimate riddle wrapped up in a mystery inside an enigma”. That’s exactly what Havana is. So go with a open heart and be ready for an unforgettable experience. For more general info about Cuba, such as money, Internet, public transportation and more, check out this post. If you’d like to carry with you a pocket guide of the city, I always recommend the reliable Lonely Planet one. So, what did you think about Havana? Share your thoughts or questions in the comments!